This bright and spacious 3-bed, 2 Bath end of terrace family home is located in a much sought-after residential area in North Dublin. This property will get significant interest from first time buyers, Families, investors and parties trading up/down alike. This Property is located across from a green which is perfect for children to play. Accommodation briefly comprises entrance hall, Livingroom, large open plan extended kitchen / dining, family room, . Upstairs there are three good size bedrooms, master ensuite and family bathroom..To the front there is a lovely walled garden with gated off street parking and to the rear there is a lovely sunny garden and patio. 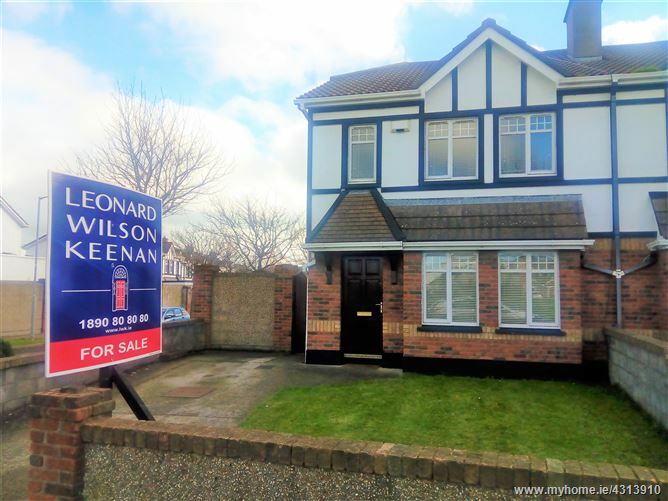 The property is located in an attractive residential estate just off the Malahide Road and is near numerous shopping options, with both the Clarehall and Donaghmede Shopping Centres within walking distance and the Northside and Swords Pavilion Shopping Centres within a short drive. It is an ideal commuter location, with easy access to the M50, M1 and Dublin Airport. The nearest bus stops are less than 10 minutes walk away, with multiple routes providing access to the city centre, while Clongriffin and Howth Junction DART stations are within 10 minutes drive. *Early viewing is strongly advised.